Need some crunch in your homemade yogurt? 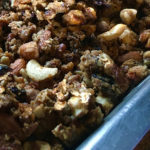 I played around with a few different granola recipes and now this grain-free granola has become a staple in our cupboard. Pair it with Greek yogurt and you have a snack or even a meal packed with 50g of protein! Here’s a pretty one-page printable version of my KH Grain-Free Granola, or follow the steps below. Don't eat your homemade yogurt without it! Line a jelly roll pan with parchment paper or aluminum foil and spray with non-stick spray. In a small sauce pan over low heat, combine peanut butter, maple syrup, honey, and vanilla. (I like the combination of maple syrup and honey, but if you don’t have both on hand, that’s fine, just use 1/3 cup of one or the other.) Heat and stir until the ingredients are melted together and smooth. Bake for 15 minutes at 350 °F. Stir mixture around with a wooden spoon. Turn oven down to 200 °F. and return pan to oven and bake for 40 more minutes or until golden brown. Take granola out of the oven and allow to completely cool. This takes about 2 hours. Store granola in an air-tight container in the fridge for about two weeks. (If it lasts that long!) It freezes great as well. Create more space in your medicine cabinet!